If you’re looking for celebrity-style spa treatments paired with seamless Hollywood hospitality, here are two havens, from the beach to the city streets, that are sure to spoil upon arrival. A recent renaissance in downtown L.A. caused an urban revival that’s left the area pulsating with award winning restaurants, classic cocktail bars, and hip hotels. The Ritz-Carlton, the first luxury hotel of its caliber in downtown L.A., plays a prominent role in the revival and in L.A.’s urban, iconic landscape. Check in to one of the Ritz’s 123 well-appointed guestrooms, one of its 14 suites, or even its 3,000-square-foot Ritz-Carlton Suite. Jet set your way to the Club Lounge with views of the beach, city streets, and Hollywood Hills. It looks like a first class airport lounge with service so sublime, you’ll find yourself requesting a pillow to park it for the night. Do manage to mosey on so you can sip a signature cocktail in a cabana at the rooftop pool bar or make a resto reso at WP24, Puck’s place, where the duck is world-renowned. Then slip in to the 8,000-square-foot spa, the only full-service hotel spa in all of downtown L.A., with nine treatment rooms and three relaxation lounges. This sanctuary was designed by Jennifer Kleen of Foda Designs in Georgia. Kleen has put her stamp on other prominent Mandarin Oriental and Grand Hyatt properties. Kleen's "Champagne and Shimmer" design theme is incorporated into the neutral color palette, complemented by opulent gold, silver, crystal, and mirror accents. Although far from the Santa Monica beach scene, the rich fabrics and luxe textures are layered throughout to evoke the calm flow of water. Do opt for the spa’s signature "Champagne & Shimmer" Body Treatment ($65), complete with an all-natural vitamin-rich acai and a raw sugar scrub infused with 24-karat gold and champagne. Following a full body polish, guests enjoy deep massages with decadent 24-karate gold shea and murumuru butter crème, leaving them with a relaxed and radiant Hollywood glow. The "Fountain of Youth" Facial ($150 for 50 minutes, $195 for 90 minutes) goes beyond Botox with an intense, customized exfoliation that soothes sun-damaged, dull, and discolored skin, resulting in a smoother, more youthful appearance. With complimentary champagne in hand, feel free to smile for the cameras. Rooms start at $299 with upgrades depending upon availability. Inquire about the Stylecation, starting at $1,200 for single occupancy, which includes an early check in, late check-out, a one-hour spa treatment, dinner for two at WP24 and a three-hour personalized StyleChic consult with Aly Scott. Tres, tres chic! The Southern Californian lifestyle is best celebrated by the beach. Santa Monica has a long and storied history of hosting Hollywood, royals, and globally savvy travelers since the turn of the 20th century. Today Santa Monica continues to woo both business and leisure travelers alike. 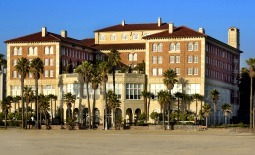 You’ll feel right at home as you slip in to this iconic 1920s Renaissance Revival-style hotel set on the shores of the Pacific Ocean in the heart of Santa Monica. You can still see the signature aesthetic of esteemed early 20th-century architect Charles F. Plummer, who envisioned a traditional yet elegant place to entice the elite when he designed the 1926 beach club, called Club Casa Del Mar. In 1999, Darrell Schmitt Design Associates maintained that original integrity, creating today what looks like a chic beach retreat. The 129 rooms alone can provide all the healing you may need with a subtle calming blue color accented in each room, a rich walnut four poster bed, crisp white linens, high ceilings, ivory sateen draperies, and Italian Calacata marble floors and walls in each bathroom. The beach breeze blowing in and panoramic views of the Pacific Coast don’t hurt and will likely have you sweet dreaming in no time. Embrace another level of relaxation with a leisurely visit to the lobby’s Veranda Lounge. The 20-foot floor-to-ceiling windows create just the picture you need for that perfect West Coast sunset. In true cinematic style this scene will be scored by the live jazz and crackling fire in the background. Top that off with another level of decadence at Catch restaurant. Perhaps the influence of the sea will convince you to order oysters; the Dungeness crab salad with green apple slaw, and basil aioli; and the wild Scottish salmon with leek fondue. You can contemplate your culinary choices while you swirl your crisp white wine or while you slip in to yet another level of bliss at their Sea Wellness Spa, which in true California fashion uses the richest and most natural products on the planet. Barcelona’s Natura Bisse and Hawaii’s own H Maloha are the spa’s signature lines. 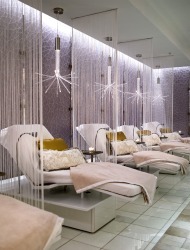 At Sea Spa, diamonds truly are a guy or gal’s best friend. You simply can’t leave the property until you try the Diamond Experience Multi-Sensorial Lifting Facial ($250 for 90 minutes). A multisensory cosmetic lift coupled with sophisticated anti-aging properties penetrates the skin’s deepest layer, regenerating and energizing, enhancing firmness, and improving the elasticity and cutaneous tone of the skin. One can truly never have enough diamonds, so the Diamond Magnetic Body Ritual ($230 for 90 minutes) is an obvious companion treatment. The ritual begins with a balancing of chakras with gems, followed by applying luminous mud with diamond dust, and finishes with a magnet-enhanced massage done. This will unload tension, stress, and common pollutants, and you’ll leave looking and feeling like a million bucks. As one of The Leading Hotels of the World, Casa is always running specials and package deals. Inquire about breakfast packages, superior room upgrades, and third-night free promotions. Of course black-out dates apply and all is based on availability. Regardless, Casa’s Veranda has one of the City of Angels’ best happy hours: $9 oceanfront cocktails and apps. Anyone would drink to that.